Hyundai's complete redesign of the Tucson for 2016 adds a healthy dose of passenger and cargo room to the formerly tiny compact SUV. The 2016 Tucson is so much larger that the distinction between Hyundai's own midsize five-passenger Santa Fe Sport becomes muddier with the Tucson's new dimensions. They're similar in size, but how different overall are they? The Tucson is still smaller than the Santa Fe, though not by as much as you'd think. Cargo room behind the backseat for the 2016 Tucson is only 4.4 cubic feet short of the 2016 Santa Fe Sport's capacity (not the seven-passenger Santa Fe, whose name is still confusing). 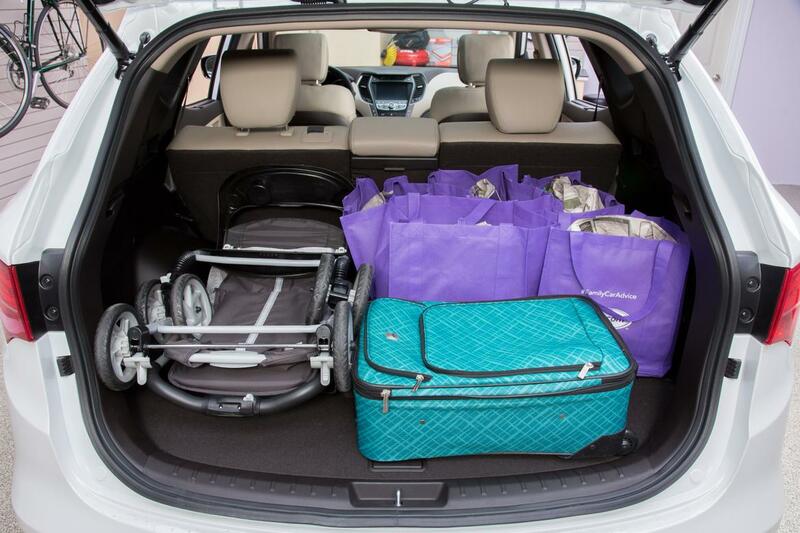 For 2016, the Tucson's cargo area not only got larger, but Hyundai also enlarged the opening. There's now 31 cubic feet behind the second row, compared with the Santa Fe's 35.4 cubic feet, which is not a distinguishable amount when the cargo area is put to use. Check out our cargo photos of the Tucson and Santa Fe Sport and you'll see gear packed into both. 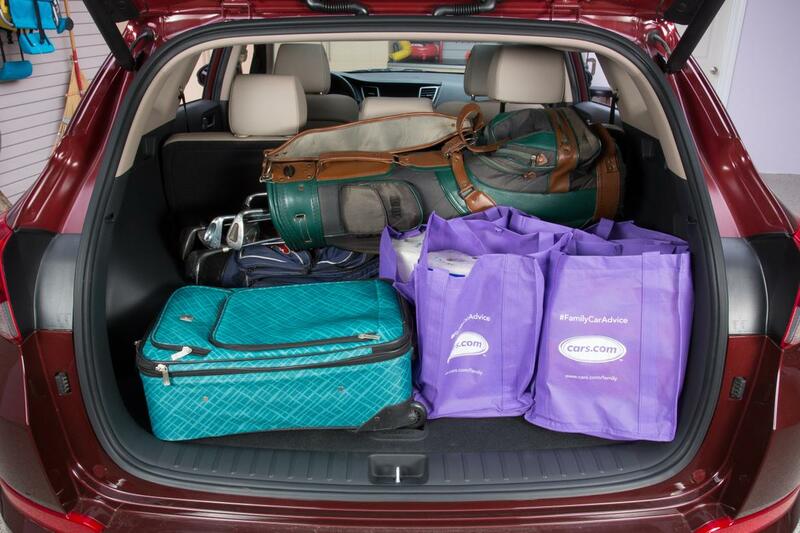 The suitcase and grocery bags occupy a similar percentage of the cargo area's trunk space behind the backseat. The Santa Fe Sport's cargo area is slightly wider, as is the whole car, but not by much. The Santa Fe Sport's exterior dimensions have an additional 8.4 inches of length, 1.3 inches of height and 1.2 inches of width. 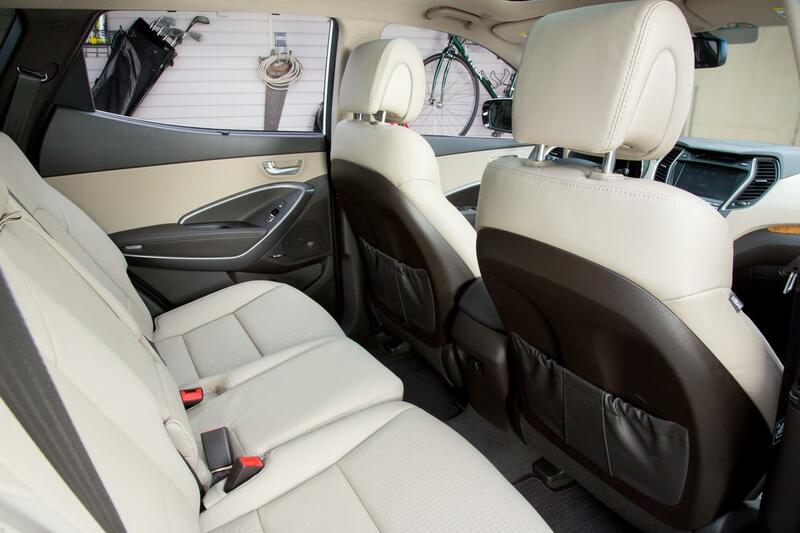 A total 61.9 cubic feet of cargo space is available with the second-row seats folded, which is significantly less space than the Santa Fe Sport's 71.5 cubic feet. 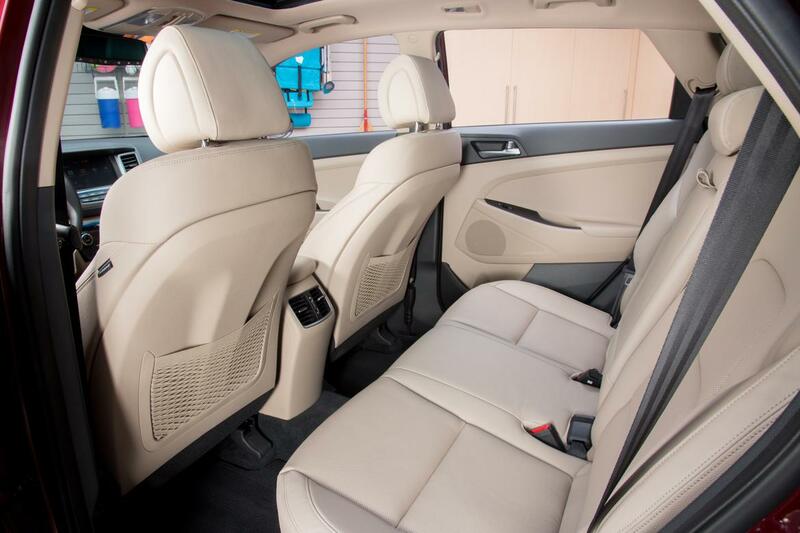 There's not a huge difference in backseat comfort, but the Santa Fe Sport does excel here with more legroom than the Tucson, plus the Santa Fe Sport's backseat slides fore and aft helping provide an extra few inches of legroom or cargo room depending which way the seat slides; the Tucson's backseat is fixed but it does recline. Conversely, the Tucson surprises with notable options the Santa Fe Sport doesn't offer, including lane departure warning, a forward collision system with automatic emergency braking and adaptive headlights on the top Limited trim level. The Tucson aces the Insurance Institute for Highway Safety's crash tests, including the difficult-to-pass small front-overlap test, and earns the IIHS's Top Safety Pick Plus designation. The Santa Fe Sport shares IIHS crash test ratings with the three-row Santa Fe, but it manages only a marginal rating in the small font-overlap test; that’s low enough to exclude it from Top Safety Pick status. 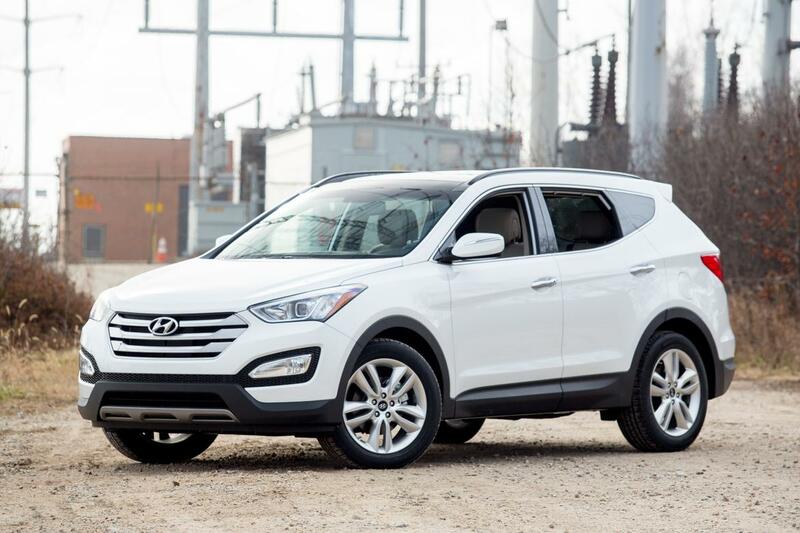 The Tucson gets its best fuel economy of 26/33/29 mpg city/highway/combined from its optional turbocharged 1.6-liter four-cylinder with front-wheel drive versus the Santa Fe Sport's best fuel economy of 20/27/23 mpg with the standard 2.4-liter four-cylinder and front-wheel drive. 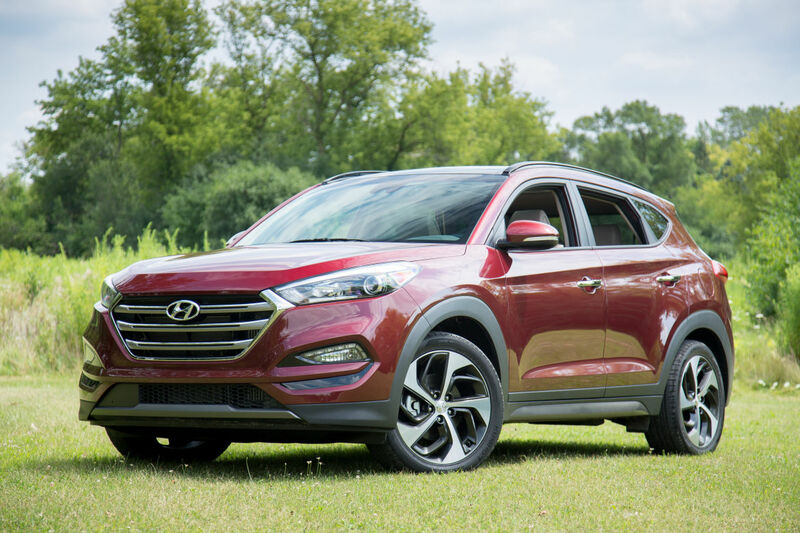 Unless you're interested in the powerful Santa Fe Sport 2.0 with the 264-horsepower, turbocharged four-cylinder engine, the Tucson is an interesting proposition given the increased room for 2016. The picture becomes a little clearer when you consider its $2,250 lower starting price and considerably better fuel economy.